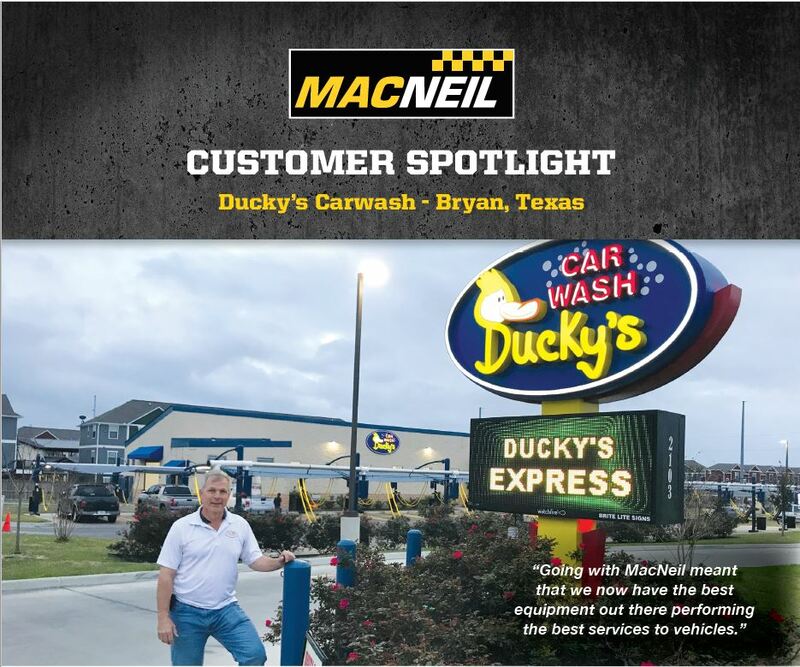 Wiggy Wash partnered with MacNeil to build two new facilities over the past couple of years. 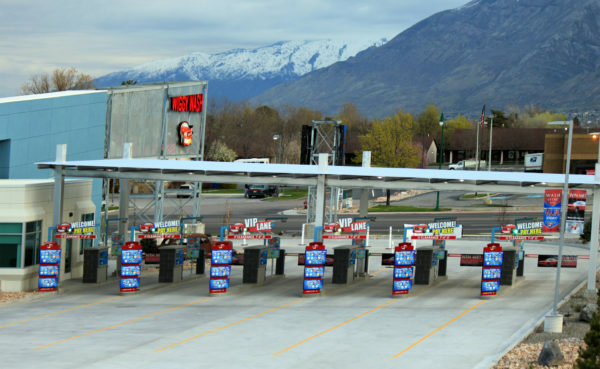 In part, due to service quality, location and a fun atmosphere, the newest Wiggy Wash locations in Orem, Utah and Canyon Creek, Utah are thriving. The Orem wash opened in February, 2017, and boasts a double express that totals an impressive 408 feet of combined tunnel. It sits on a main highway artery with forty thousand cars a day buzzing by, and processes up to 2,000 cars per day. 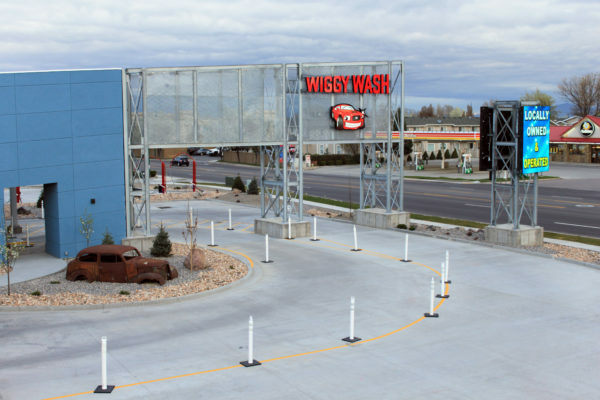 “We process the cars so quickly that the place looks desolate until you get up to the tunnel and see how full it is,” explains Brent Wignall, CEO of Wiggy Wash. The Canyon Creek wash opened in November of 2017 and is situated right at the entrance of Utah’s largest single-story shopping center. MacNeil also upgraded and retrofitted the other two more established facilities—one in Springville, UT and one in Spanish Fork, UT. “We’ve built our locations with growth in mind like reserving room to add equipment to go with a higher chain speed, for example,” he points out. 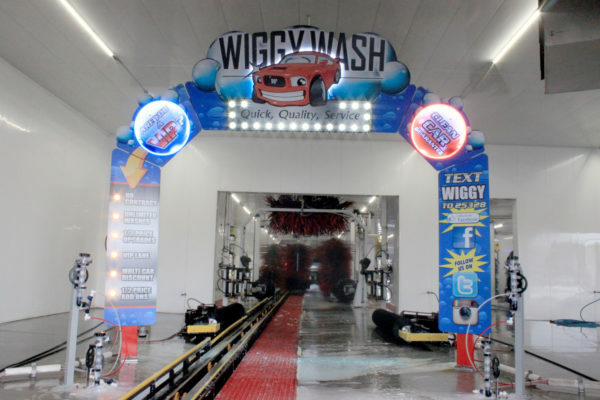 The Wiggy Wash concept is centered around creating an enjoyable atmosphere and premium washing but what also stands out is their dedication to efficient use of resources with an eco-friendly goal in mind. Some very notable sustainability efforts include the wash tunnel electrical output that is controlled by an intelligent wash system and a 90% water re-usage attainment. In addition, Wiggy Wash locations use all biodegradable soaps and environmentally friendly chemicals. The concept is simple but key— look past the bells and whistles to ensure that the equipment you’re about to purchase actually does what you need it to do. This is something that Wignall and his team took seriously in making the decision to go with MacNeil. “MacNeil solved the high maintenance issues we were concerned with and the products are clearly in line with what we’re trying to deliver to our customers,” explains Wignall. Some companies have very fast set up times that don’t always translate into reliable equipment functionality. Wignall points out the significance of taking more time in the beginning to set up MacNeil equipment for fine tuning. 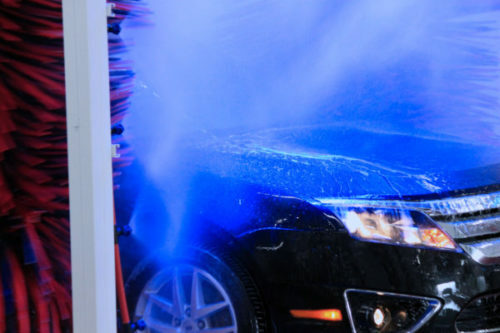 “Once it’s set up it is flawless and I think most would agree that reliability is worth putting the time in up front.” The Wiggy Wash team was also pleased with the fact that things like the powder coating on MacNeil equipment is still intact and looks new even after years of use. “Attention to these types of details and assurance of quality is what makes MacNeil our only choice,” says Wignall.